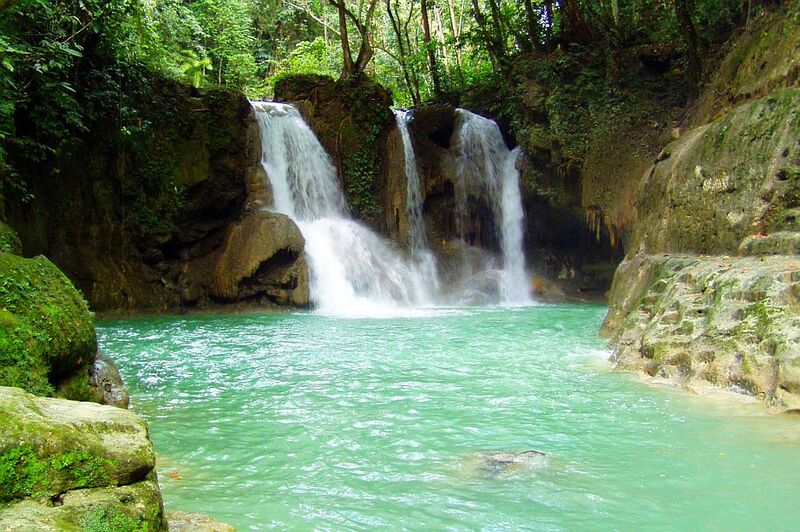 Welcome to The Mag-aso falls in Antequera, Bohol, Philippines. Every year over 2,000 visitors travel here to view the Mag-aso waterfalls in Antequera, Bohol and other popular waterfalls in Bohol. These large waterfalls attract many species of animals as well as providing a beautiful picturesque place to relax and unwind in a pool of healthy natural mineral rich water. The falls are one of the major tour attractions here in Bohol, Philippines. Mag-aso falls a great place to visit when in Bohol and is usually not crowded as its presence is still not covered by most of the Bohol tour itineraries. This particular waterfall is 25-feet tall cascading into a large pool at the bottom. About 20 kilometers from Tagbilaran City, It is about 30 minutes by car or motorcycle from the city and should provide a cool relaxing, scenic drive to the destination. Mag-aso falls offers concrete tables and chairs at a small fee. Lifejackets and lifesavers are for rent for P50. This is a must see tour to ad to your itinerary of Exciting bohol tours.